A young son discovers he does not have exactly the same skin colour as either parent. He questions this revelation and his parents explain using animals during a visit to the zoo. A candid look at children of mixed race and multiculturalism learning about their identity for the first time through a colourful illustrative story. 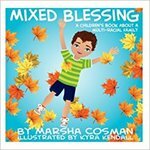 Cosman, Marsha, "Mixed Blessing: A Children's Book About a Multi-Racial Family" (2012). DIVerse Families. 359.